Wow apple cider vinegar gentle and natural detox formula for stressed tresses removes build-ups. Restores shine and smoothness. Made with natural apple cider vinegar. Enhanced with pure apple extracts. Ecocert certified bioactive haircare contains no sulphates or paraben undo the everyday damages heaped by styling products and dusty pollution on your hair and scalp. 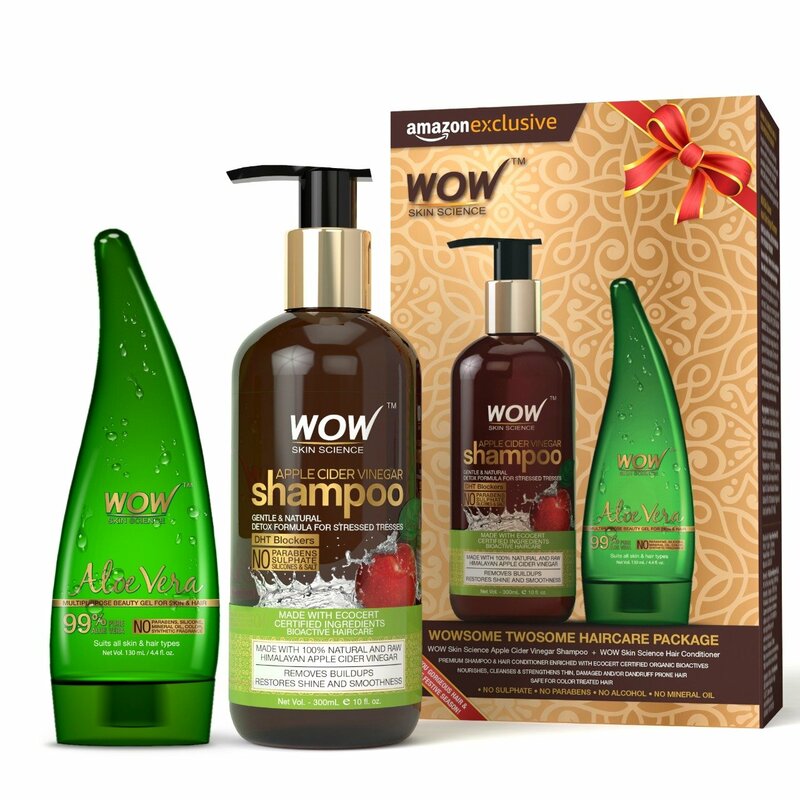 Cleanse your crowning glory with wow apple cider shampoo that comes powered with organic and pure apple cider derived from genuine Himalayan apples. Softly scented with natural apple extracts, this sweet smelling shampoo gently clears up all build-ups to let your scalp breathe free and to leave your hair naturally smooth and shiny. To use - wet hair. Pour a generous dollop on the palm. Massage well into soaking wet hair and scalp using fingertips. Work up a rich lather. Rinse thoroughly. Pamper your skin and hair with wow skin science aloe vera gel, the purest and the finest you can get in a bottle. Guaranteed 99 percent pure, wow skin science aloe vera gel has been hygienically extracted from ripe, robust and succulent aloe vera leaves and packaged with care to retain its natural healing and rejuvenating goodness. Aloe vera has been used for thousands of years for beauty and medicinal benefits across cultures. Aloe vera is loaded with over 75 beneficial nutrient like vitamins, enzymes, minerals and amino acids. When applied topically on skin, it inhibits microbes and germs, moisturizes skin. Similarly, when applied to hair and scalp, it conditions and protects hair from dryness and damage.